Published: March 2, 2013 at 05:14 p.m. Updated: March 3, 2013 at 03:25 p.m. Reduced to a role player last season, Randy Moss still made it to a Super Bowl with the San Francisco 49ers. If the team returns to the game's biggest stage next season, the wide receiver likely will not join them. 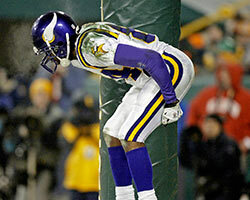 Take a look at photos of Randy Moss through the years. A league source told ProFootballTalk that 49ers personnel made it clear at last week's NFL Scouting Combine that Moss won't be back with the 49ers next season. It can't be called a surprise. The 36-year-old Moss totaled just 28 receptions all season. Absent from his game were the speed, power and elusive feet that had terrorized defenses during most of his 14-season tenure in the NFL. Moss was widely praised by his 49ers' coaches and teammates as a positive force in the locker room and meeting room. He's always been one of the smartest players around, and it's not inconceivable another team comes calling. If it is, indeed, the end, we're sure to see Moss again on some August day in Canton, Ohio.